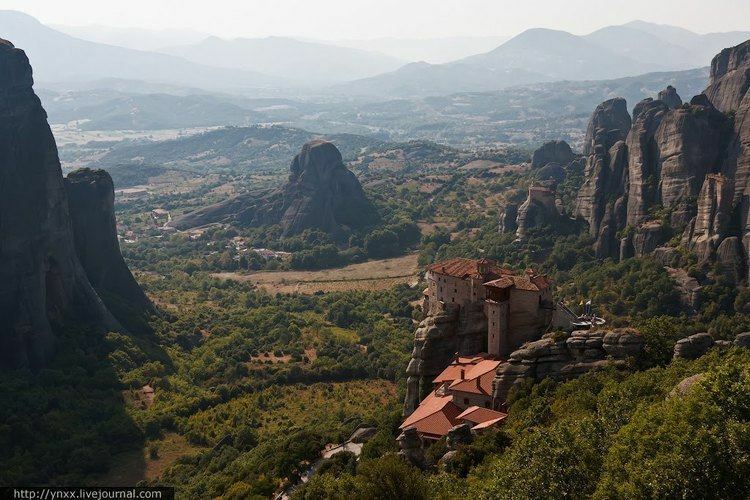 Thessaly (Greek: , Thessalia; ancient Thessalian: , Petthalia) is a traditional geographic and modern administrative region of Greece, comprising most of the ancient region of the same name. Before the Greek Dark Ages, Thessaly was known as Aeolia (Greek: ), and appears thus in Homers Odyssey. Thessaly became part of the modern Greek state in 1881, after four and a half centuries of Ottoman rule. Since 1987 it has formed one of the countrys 13 regions and is further (since the Kallikratis reform of 2010) sub-divided into 5 regional units and 25 municipalities. The capital of the region is Larissa. Thessaly lies in central Greece and borders the regions of Macedonia on the north, Epirus on the west, Central Greece on the south and the Aegean Sea on the east. The Thessaly region also includes the Sporades islands. Thessaly was home to extensive Neolithic and Chalcolithic cultures around 6000–2500 BC (see Cardium Pottery, Dimini and Sesklo). Mycenaean settlements have also been discovered, for example at the sites of Iolcos, Dimini and Sesklo (near Volos). In Archaic and Classical times, the lowlands of Thessaly became the home of baronial families, such as the Aleuadae of Larissa or the Scopads of Crannon. In the 4th century BC Jason of Pherae transformed the region into a significant military power, recalling the glory of Early Archaic times. Shortly after, Philip II of Macedon was appointed Archon of Thessaly, and Thessaly was thereafter associated with the Macedonian Kingdom for the next centuries. Thessaly later became part of the Roman Empire as part of the province of Macedonia. Thessaly occupies the east side of the Pindus watershed, extending south from Macedonia to the Aegean Sea. The northern tier of Thessaly is defined by a generally southwest-northeast spur of the Pindus range that includes Mount Olympus, close to the Macedonian border. Within that broken spur of mountains are several basins and river valleys. The easternmost extremity of the spur extends southeastward from Mt. Olympus along the Aegean coast, terminating in the Magnesia Peninsula that envelops the Pagasetic Gulf (also called the Gulf of Volos), and forms an inlet of the Aegean Sea. Thessalys major river, the Pineios, flows eastward from the central Pindus Range just south of the spur, emptying into the Thermaic Gulf. The region is well delineated by topographical boundaries. The Chasia and Kamvounia mountains lie to the north, the Mt. Olympus massif to the northeast. To the west lies the Pindus mountain range, to the southeast the coastal mountains of Ossa and Pelion.